ScienceDaily has brought us yet another interesting article related to the National Science Education Standards Life Science Content Standard. My guess is that middle school teachers’ and students’ olfaction capabilities might be a bit superior to the general public’s, given my personal experience in teaching middle school! Nonetheless, scientists from Northwestern University’s School of Medicine report that imperceptible levels of scents affect our judgment in unconscious ways. The article, Subliminal Smells Bias Perception About A Person’s Likeability, does not explicate the researchers’ questions or hypothesis, but inference indicates their questions were: What concentration levels of scents can people consciously detect? How does scent affect human judgment of the likeability of other humans? The study suggests that people conscious of the barely noticeable scents were able to discount that sensory information and just evaluate the faces. It only was when smell sneaked in without being noticed that judgments about likeability were biased. Do your students participate in a Science Day competition or activity? Then you know how hard it can be to help students find a topic they can relate to and apply the methods of science. Sharing this article with your students and accompanying it with a discussion of the methods of science used here might just be the perfect bridge to help your students find an accessible topic. Since particular sample sizes and data analysis methods are not described in the article, you and your students could brainstorm a variety of possible approaches. You could follow up by going through your local library’s electronic periodical data base to find the researchers’ original report in the December 2007 issue of Psychological Science, “Subliminal Smells Can Guide Social Preferences” by Wen Li, Isabel Moallem, Ken A. Paller, and Jay A Gottfried, and sharing with your students the methods these researchers did use. A discussion of the pros and cons of their methods as compared to those brainstormed by your students could round out your lesson. The ScienceDaily article can also be used as an introduction to a unit on the senses (i.e., structure and function in living things) or on regulation and behavior, both topics within the NSES Life Science Standard. After sharing the article with students, ask: From an adaptive perspective, what value might there be in this phenomenon of imperceptible levels of scent causing unconscious behavior? Are humans the only organism likely to display this trait? How do you know? Here are some additional resources that are part of the Middle School Portal 2 collection to facilitate your instruction regarding structure and function in living things, olfaction, methods of science, and regulation and behavior: Structure and Function in Living Systems; Enose Is Enose Is Enose; Discovery, Chance and the Scientific Method; Regulation and Behavior. This post was originally written by Mary LeFever and published December 13, 2007 in the Connecting News to the National Science Education Standards blog. The post was updated 4/23/12 by Jessica Fries-Gaither. For us humans, especially in urban settings, the seasons come and go with regularity and cause relatively painless changes in our lives — longer days, shorter days, setting clocks forward or backward as we just did. But for most other animal species seasonal changes do not go unnoticed. Further, when climate change impacts patterns of seasonal change, animals can be affected. 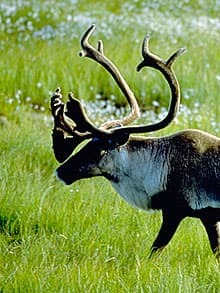 Caribou are cued to move to new grazing patches by increasing day length. The plants, however, are cued to emerge or germinate by increasing temperature. This causes a “trophic-mismatch.” If the trend continues, caribou will not survive unless they can find a substitute for their nourishment needs. This may be possible in one of two ways. One is an additional plant species, useful to caribou, becomes established in the ecosystem made possible by the longer growing season. The second way caribou could thrive is if the caribou alter their migration patterns to better align calving with plants at their peak nutrition. Doing so would be a case of the caribou population shifting its range. According to a second ScienceDaily article, “One of the main predicted effects of climate change is a forced shift in species’ distribution range.” This comment was made in reference to a plankton scientists have decided was able to change its range to further north in the Atlantic after the last warming trend in climate 18,000 years ago. They attribute this ability to a lot of genetic variability within the species and large populations. This, they say, is good news since it indicates the species can react and adapt appropriately in order to survive and avoid extinction. It is also a cause for optimism since plankton is the base of the food chain. Conversely then, small, less variable populations are at risk of not adapting to and surviving climate change. What if anything can or should be done? The National Science Education Standards in life science states students should gain understanding in (1) structure and function in living systems, (2) regulation and behavior, and (3) diversity and adaptations of organisms. Climate change affords opportunities to touch on those areas as well as topics in Science and Society, and Earth Science concepts in climate. Ask students what caribou are, where they live and how they behave. Or direct students to do their own research. This Natureworks site provides a succinct reference for students. Most will probably know caribou migrate and live in Alaska, but students may not know they also live in Greenland. Many will say caribou are reindeer. Though they are related, they are different. Reindeer are domesticated and live in northern Asia actually. Students may know caribou migrate, but they may not be fully aware of the adaptations the caribou have, enabling the thousands of miles of migration accomplished each year. Ask students what cues caribou to migrate north in the spring: increasing day length or increasing temperatures? Since temperatures vary, it is adaptive perhaps that caribou respond instead to increasing day length, which is rather constant in its annual pattern. Now focus on the plants of the tundra. What signals plants it’s time to emerge? Warming temperatures rather than light. After all, an underground root system or a buried seed cannot sense light. To track average temperatures from 1995-2003, students can access Excel files of the data from the Arctic Long Term Ecological Site. In pairs or groups of three, students can find tundra temperature data for a specific year and then share. They can have the program calculate the average temperature each year for the month of June or the first week in June. Graph the data points. What is the pattern? Tundra plants are low to the ground and small. Caribou have to do a lot of grazing to meet their needs. Turn student attention to the calving and nursing period. Calves nurse for about one month. Nursing caribou need lots of nutrition during that period. What if calves were born one week after plants had reached their maximum? How might this impact the herd over time? Remind students of the two different cues plant and caribou respond to: light and temperature. How might the plant diversity be impacted by a warming trend? Share the plankton story with students. In sum, two things can happen in response to climate change: adapt or go extinct. Life on the planet survived the last warming trend; thus it may survive this one too. However, human contributions to this warming trend were not present 18,000 years ago. It remains to be seen what difference that makes. Here are additional related resources from the Middle School Portal 2: Science and the Polar Regions and The Reason for the Seasons. This post was originally written by Mary LeFever and published November 5, 2008 in the Connecting News to the National Science Education Standards blog. The post was updated 4/23/12 by Jessica Fries-Gaither. This post focuses on the definition of species and its implications beyond science content knowledge—specifically, how the definition is related to species conservation and protection. For example, the brown bear of the Iberian Peninsula is a different species compared with other European brown bears because it is geographically isolated, right? According to a press release, New Study Changes Conditions for Spanish Brown Bears, published by AAAS’s EurekAlert! there are just two small populations of this bear and they are threatened. One idea to help bolster their population size is to introduce brown bears from other European populations. However, this may cause hybridization and eventual loss of the Iberian Peninsula brown bear species. Further, what makes conservation biologists think the two different bears will interbreed successfully? Can we take for granted that middle school students have developed an accurate concept of species on their own, through personal experience? Because they can distinguish cat from dog, a rose from a maple tree, and a human from an ant, is it safe to assume they have a good grasp of the concept? Not if we wish to facilitate and broaden students’ conceptual understandings to progressively more sophisticated levels. Students understand that cats and dogs, roses and maple trees, and humans and ants do not interbreed. Thus, they have an understanding of the biological definition of species. But things can get complicated and this definition does not always fit. Another perspective assumes reproductive isolation defines species. That is, if two populations are physically or temporally isolated preventing interbreeding, then they are considered separate species. That works well conceptually for most middle school students’ experience, but what about when individuals from one geographically isolated population are introduced to another, either intentionally or unintentionally, and they successfully interbreed? When discussions around Mendelian genetics occur, the concept of hybrid is introduced. Plants do this all the time. Is the hybrid a new species? They often can and do interbreed. Are the offspring a new species? Most would hesitate to say yes. Then do we revise our definition of species? Those reproductively isolated populations really are the same species after all? Assuming a fixed definition of species may be unreasonable. One’s definition of species is contextual, dependent upon the current issue under consideration. It is important that discussants have a common definition of species in these instances. Why? Because the focus of and outcomes of species-related discussions can determine political policy, such as what gets listed as a threatened or endangered species and receives federal funding for protection from habitat destruction or hunting. DNA sequencing allows for almost unequivocal determination of whether individuals from two different populations are the same species, and consequently subject to the same political treatment. In the case of the Spanish brown bears, DNA sequencing suggests they are not a distinct species from other European brown bears. That means introducing bears from other populations will not supplant the Iberian Peninsula brown bears. The proposed conservation strategy is a viable one. Scientists are confident that the introduced bears will successfully interbreed with the Spanish brown bears due to the genetic similarity. This constitutes a prediction, and its accuracy will be determined only after bears are introduced into the area. Consider the American Bald Eagle. It is cited as a success story of the Endangered Species Act (ESA). It has recovered from its endangered status and was delisted in 2007. This means the bird is no longer protected under federal law in terms of some kinds of hunting and habitat protection. States are free to make their own regulations regarding hunting and protection of the species. More recently, the Northern Rocky Mountain population of gray wolf was delisted. The Western Great Lakes grey wolf population was also delisted. States that are host to these two populations have the power to regulate hunting and management of the animals. However, any wolves on National Park Service land or outside the two areas mentioned above, are under federal government protection. How is species defined? Ask students if dogs and wolves are separate species. How do they know? Accept all reasonable responses. Are lions and tigers? Are saber toothed cats and Bengal tigers? Lead students to define species in terms of (a) macroscopic anatomy, (b) geographic isolation (lions and tigers), and (c) temporal isolation (extinct and extant cats). This discussion should highlight the difficulty in pinpointing a definition. None is incorrect, yet none is fully sufficient. This is acceptable in classroom discussions, but when conservation groups discuss species, they have to be specific. For example, in delisting the Rocky Mountain gray wolf, the documents specify the geographic region that defines the population. Individual animals falling outside the defined geographic range are not delisted and remain protected by the ESA. Can students imagine that features other than those immediately visible could be considered in determining who is different and who is the same species? For example, in Batesian mimicry two species are physically similar, but one is poisonous to predators while the other is not. Lead students to understand that there are microscopic or chemical means of determining similarity and differences. Conversely, two populations can appear to be quite different but are chemically quite similar. (This may explain the original assumption that the Spanish brown bear was a separate species from other European brown bears.) The morphological difference is attributed to environmental influences, not genetic differences, and so it is predicted the two populations could interbreed successfully. That’s often good news for conservation management. What do students think the Endangered Species Act is? Why is it needed? Allow them to brainstorm. Then show them pages from http://www.fws.gov/endangered/about/index.html to either confirm their list or amend it. Can they name any organisms on the list now? Call attention to species other than mammals, including plants. How do students suppose an organism gets listed/delisted? Have students investigate this question at http://www.fws.gov/endangered/species/us-species.html. Facilitate student discovery that the process is not neat and easy necessarily. Rather it can be emotional and partisan. Why? Here are some additional resources from the Middle School Portal 2 related to conservation and wildlife management: Natural Resources, the Environment, and Ecosystems; and DDT Quest. This post was originally written by Mary LeFever and published March 26, 2008 in the Connecting News to the National Science Education Standards blog. The post was updated 4/23/12 by Jessica Fries-Gaither.